Today marks one month to go until Producer Sessions Live and we're celebrating by giving away 100 tickets at just £5 in our 24 hours flash sale. Producer Sessions Live is the UK's premier event for hi tech music, coming to London and Manchester this September 2013. The event will feature masterclass sessions from production icons like Nu:Tone, Steve Mac, Dom Kane, Stefano Ritteri, Shadow Child to name a few. There will also be tons of gear from exhibitors, including Pioneer, Yamaha, Moog, Arturia, Rob Papen and more, plus many products to buy and sample from our retail partner Absolute Music. Your £5 entry ticket Includes access to exhibitors plus a free pass to the Producer Sessions Live After Party on the Saturday where our guest producers will be performing. 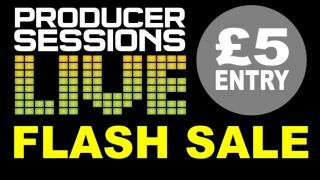 The Producer Sessions Live flash sale starts midday Friday 9 August and ends Saturday 10 August at midday sharp! For show updates follow Producer Sessions Live on Twitter and Facebook.